In this ideal alternative to dominoes, place your coloured parts in contact with the Chromino already installed. Each chromino is 3 squares long, each of these squares can be of a different color. A placed piece must be placed next to at least one other piece, so that the piece has two colours connected with its neighbours. To take it away, put all your parts down. Simple and fluid, easy to play, Chromino can be played with family and friends, regardless of the age of the players! 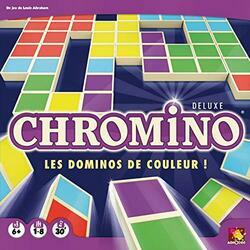 The deluxe version of the famous Chromino with real dominoes to discover or rediscover this great classic! Contents of the box : 80 tiles, 1 bag, 1 rule of the game, 8 easels.